NEWS RELEASE/for immediate release Ralph’s World Presents ‘Time Machine Guitar’: Giveaway Opportunity! NEWS RELEASE/for immediate release Ralph’s World Presents ‘Time Machine Guitar’ Giveaway Opportunity! Amidst a busy summer of dozens of concerts, Ralph’s World, the Grammy nominated songwriter, performer and author, will release a new album of original story-songs, Time Machine Guitar, on August 4. The album liner notes will include a booklet of biographical information on the historical figures featured on the album. Historical people come to life, as Ralph paints a picture of the boy King Tut playing with toys, or Mozart and Haydn (who were real-life friends) chat about music. Ralph, who studied classical music while beginning his career in rock music, says, “I used the song ‘Beethoven’s Horse’ as a vehicle to demonstrate the different styles of their musical compositions by recasting the same melody as each of them might have interpreted it.” A learning guide will be available this fall. A pilot for “Time Machine Guitar” originally aired on Chicago public television, WTTW. A series of “Time Machine Guitar” episodes is launching on the Ralph’s World YouTube channel. Fans who subscribe to the channel will be the first to view new episodes every other Saturday morning. In the show, Ralph lives in a colorful tree house with his three puppet animal friends, Rani, a squirrel, Beauregard, a dog, and Malcolm, a cat. Together they make and learn about music, and go on trips through history with Ralph’s Time Machine Guitar to visit interesting people like Dr. Martin Luther King, Amelia Earhart, and Tito Puente. 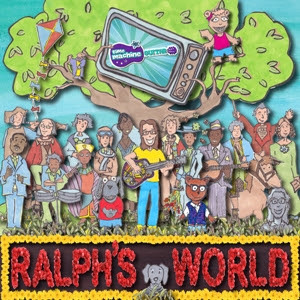 Since his first children’s recordings in the early 2000’s, Ralph’s World has won numerous awards and critical acclaim for his 12 children’s albums and music videos (released on Minty Fresh, Waterdog Records and Disney Sound). He has published four children’s books, created scores for musical theater, and has toured the nation performing for thousands of fans at venues ranging from Lollapalooza to Austin City Limits, as well as sold-out crowds at Ravinia Festival in Chicago, Symphony Space in New York and the Getty Museum in Los Angeles. His last children’s album was Ralph’s World Rocks and Reads (2015). Ralph Covert continues to lead the grown-up, Chicago-based rock band The Bad Examples, who still perform together frequently. He also records and performs solo shows. A Ralph Covert acoustic album is scheduled for early 2018, tentatively titled Little Bird. For the third year in a row, Ralph will curate the Lil’ Pilgrims family stage at Pilgrimage Festival in Franklin, TN, and he will perform there and on the main stage that weekend. Find all upcoming concert details at www.ralphsworld.com. We have teamed up for a Giveaway! To enter, leave a comment below! Deadline to enter is September 16th, 2017! U.S. Residents only, please! Self Disclosure: Info and images were provided by Sugar Mountain PR. My kiddos will love this. What a great cd this looks like. thanks! I’d like this for my son. thank you for the chance.